The Bangkok Chess Club and Thailand Chess Association have the honor of inviting all Chess Players to participate in the 12th Bangkok Chess Club Open 2012 from 13th to 19th of April 2012 in Bangkok, Thailand. Tournament will be held in a 5 star Dusit Thani Bangkok Hotel. We are looking forward to attracting more than 250 players from 50 countries. Tournament is expected to be the biggest and strongest ever held in Thailand. Open: Prizes are for 1-10 ranks and 5 best Thais, with certificates for 3 Best Juniors and Best Lady. 1st prize will be 100,000 Baht. In the event of dispute the Chief Arbiter’s decision is final. The above rates are inclusive of service charge, VAT, breakfast and internet. For accommodation reservations at the venue please contact Ms. Sachon (sachon@dusit.com). 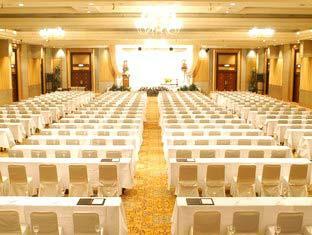 Open: 3,000 Baht (late registration fee after March 10, 2012 is 3,500 Baht). Challenger: 1,500 Baht (late registration fee after March 10, 2011 is 2,000 Baht). All tournament fees must be paid before the start of the first round (US$1 is approx. 33 Baht, € 1 Euro is approx. 43 Baht). Registration: The deadline for registration is March 10, 2012. After this a late registration charge will be added. However, organizers reserve the right to refuse or decline late registrations. Conditions for Titled Players: Tournament fees are waived for GMs, WGMs, IMs, WIMs and 2500+ rated players (according official FIDE March 2012 rating list). First 15 GMs to register will get complimentary accommodation (room & breakfast in twin sharing with another GM for 8 nights). Complimentary room reservation is confirmed after receiving a refundable deposit of 3,000 Baht (approximately € 70), which can be done by registering for the tournament and paying the entry fee. This deposit will be fully returned after check-in to hotel. Please contact organizer for inquiries. Other information. 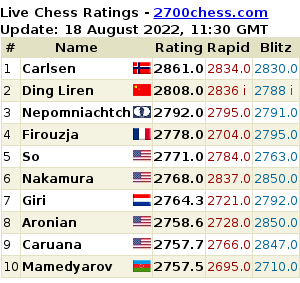 Tournament results and parings will be updated daily to www.chess-results.com.